The first glimpse of Petra's Treasury (Al-Khazneh) upon exiting the Siq. 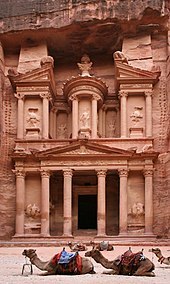 Al-Khazneh (Arabic: الخزنة‎; "The Treasury") is one of the most elaborate temples in the ancient Arab Nabatean Kingdom city of Petra. As with most of the other buildings in this ancient town, including the Monastery (Arabic: Ad Deir), this structure was carved out of a sandstone rock face. The structure is believed to have been the mausoleum of the Nabatean King Aretas IV in the 1st century AD. It is one of the most popular tourist attractions in both Jordan and the region. It became to be known as "Al-Khazneh", or The Treasury, in the early 19th century by the area's Bedouins as they had believed it contained treasures. Al-Khazneh was originally built as a mausoleum and crypt at the beginning of the 1st century AD during the reign of Aretas IV Philopatris. Its Arabic name Treasury derives from one legend that bandits or pirates hid their loot in a stone urn high on the second level. Significant damage from bullets can be seen on the urn. Local lore attributes this to Bedouins, who are said to have shot at the urn in the early 20th century, in hopes of breaking it open and spilling out the "treasure"—but the decorative urn is in fact solid sandstone. Another legend is that it functioned as a treasury of the Egyptian Pharaoh at the time of Moses (Khaznet Far'oun). Many of the building's architectural details have eroded away during the two thousand years since it was carved and sculpted from the cliff. The sculptures are thought to be those of various mythological figures associated with the afterlife. On top are figures of four eagles that would carry away the souls. The figures on the upper level are dancing Amazons with double-axes. The entrance is flanked by statues of the twins Castor and Pollux who lived partly on Olympus and partly in the underworld. In 1812, the city of Petra and Al-Khazneh was rediscovered by Swiss explorer Johann Ludwig Burckhardt. As Western Europe continued to explore the Middle East, tourism became more common, and by the 1920s, a small hotel had opened near Petra. While Petra was not as popular as larger, more central cities like Cairo, tourism started to change the economy and social structure of the Bedouin people who lived nearby. Tourism is now the main source of income in Jordan. Hotels, souvenir shops, restaurants and horse rental services are all found within a few mile radius of Petra itself. While the economic effects have been largely positive, the site itself faces threat from the increased tourism. Humidity from large crowds of people visiting the site can cause damage to the dry sandstone. White spots have appeared on walls and columns from stearic acid deposition due to hands resting against the walls. The Khazneh surface itself has receded by 40mm in less than ten years from touching, leaning, or rubbing on the walls of the Khazneh. The Treasury has appeared in many Hollywood movies, gaining particular fame after being featured in climactic scenes in the popular 1989 film Indiana Jones and the Last Crusade, in which its facade is represented as the entrance to the final resting place of the Holy Grail near Hatay. The interior scenes of the temple were filmed at Elstree Studios in England. Ancient Megastructures: Petra, a television series from National Geographic Channel, is dedicated to the Khazneh, explaining how it was created through human resourcefulness and courageous endeavour. The Treasury is also depicted in Hergé's The Red Sea Sharks, one of the Adventures of Tintin, Sinbad and the Eye of the Tiger, Sky 1 travel series An Idiot Abroad, The Sisters of Mercy 1988 music video for Dominion, the movie Transformers: Revenge of the Fallen (2009) where the Matrix is located[Citation Needed], the history series The Naked Archeologist, and the Korean drama "Misaeng". ^ "Jordan - Touristic Sites - South of Amman". Archived from the original on 13 May 2008. Retrieved 2008-05-28. ^ Aretas, I. "Petra: History, Myth, and Earthquakes" (PDF). pp. 2–3. Archived from the original (PDF) on 28 December 2004. Retrieved 23 December 2009. 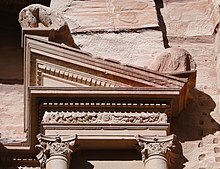 ^ "Petra Map & Monuments". AtlasTours.net. Archived from the original on 4 January 2010. Retrieved 23 December 2009. Its elaborately carved facade is alive with a cast of Nabataean deities and mythological characters ... All are funerary symbols. ^ Shoup, John (Spring 1985). "The Impact of Tourism on the Bedouin of Petra". Middle East Journal. 39 (2): 277–291. JSTOR 4327067. Wikimedia Commons has media related to Al Khazneh.